We met in 1999 and since that meeting we travelled together through many different musical projects and many different places. Our vision has always been to make music which has a therapeutic effect on the people who hear it. This vision has led us to a variety of beautiful instruments and sounds. We use Singing Bowls (Tibetan and Crystal), we play Monochords, we play and make Ocean -and Frame Drums and we often introduce other holistic instruments when the feeling is right. The foundation of lots of our music is the Gong. The Gong is an incredible tool for transformation. We learned about the art of gong playing from the great gong master Don Conreaux - A Yogi Bhajan disciple. We have also studied sound massage courses with Tibetan monks - including the techniques of "Sound Bath" and "Contact massage". Most recently in 2017 we did a course in Music Therapy with EMTA (Estonian Music and Theater Academy). We are very glad that our story has crossed your path, we hope you enjoy our music and that we all continue to discover more about the healing power of sound. ...one of the world's oldest instruments, will help You achieve a deep state of relaxation. According to Oriental philosophy, Gongs organic sounds help to get rid of fear and other negative emotions. Gong sounds will clear and balance the brain waves. This will contribute to increasing creativity and multiplies the activity of the immune system. Our brain works at certain frequencies. There are five different frequencies, as we know, at which our brains resonate. These are called Alpha, Beta, Delta, Gamma and Theta waves. The Alpha brainwave state (8-12Hz) is the frequency of daydreaming and imagination and is quickly achieved. In Theta stage, a state of deep relaxation, the brain wave activity slows 4-7 cycles per second. Theta waves belong to our subconscious. This is the place where our memories and experiences are stored. Theta waves are predominant when a person experiences creative impulses and inspiration. In real life we experience Theta waves every night. This usually occurs for about 30 minutes during sleep. As the mind and body relaxes, the brain enters Theta state (4-7 Hz: deep meditation and psychic awareness). Theta is an ideal level of consciousness for healing to occur. Gong allows us to stay in the Theta state as long as we play it. ...is a celebration and sound meditation. The gongs will be played gently throughout the night. Early morning whilst guests sleep/meditate bathed in the healing vibrations of the gongs. In the early morning the gongs will go silent and the meditation will end. 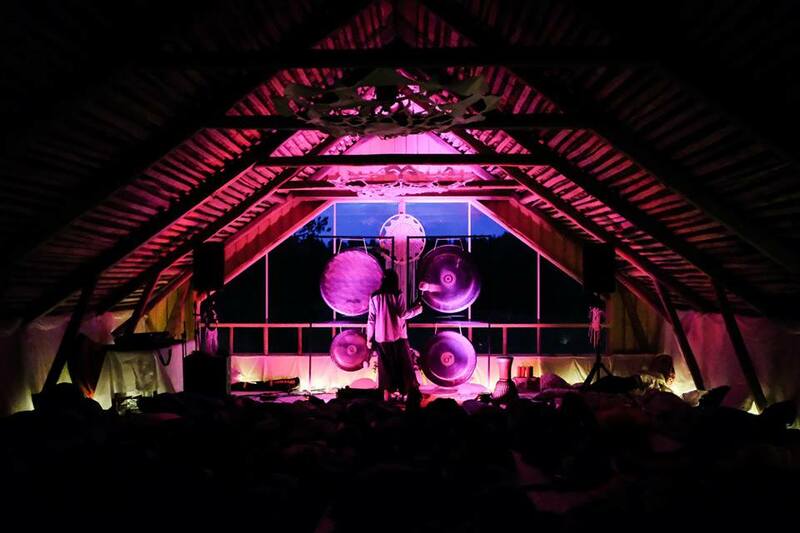 You will be immersed in the sound waves of the gongs and as these vibrations wash over you they give space and opportunity to release tensions, blocks and induce a deep state of relaxation, emerging feeling re-energised. The harmony created by the gong tones brings about an inner stillness where deep healing can occur.